The iPad is a great device for reading. And there are a variety of apps focused solely on reading ebooks with the device—almost all of which work on the iPhone, too. So how do you judge a reading app? What are the criteria? For me, I want an app with a pleasant reading experience—in other words, an app that gets out of the way and lets the words on the page shine. I also want an e-reading app to take advantage of the fact that it is an app: It should offer benefits like a built-in dictionary, easy and fast navigation and search, and customization options. And an ebook app is only as good as the content you put into it, so I want a store with a massive ebook selection, and one that’s ideally easy to browse from my iOS devices, too. 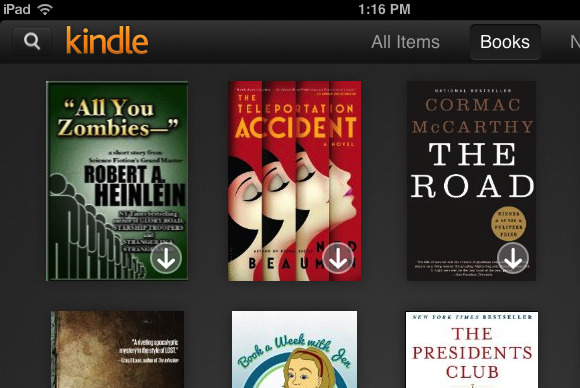 Amazon’s Kindle app shines on all those fronts. That’s why—despite competition from no lesser a giant than Apple—it’s still the best e-reading option in the App Store. In terms of getting out of the way: Tap on a page as you read in the Kindle app, and all the accoutrement—the buttons, the progress bar, the whatnot—vanish. It’s just you and the book’s text. The Kindle app has plenty of customization options to tweak its look. But the Kindle app still exploits its app-ness. You can customize its look in a variety of ways: You choose among three different themes (black text on white, white text on black, or dark brown text on a sepia-toned background); a variety of fonts and font sizes; and three different margin widths. There’s a built-in brightness control, too. And book navigation is very quick: Just swipe or tap to turn pages. Search results load fast, and are simple to navigate. And—unlike iBooks—Kindle can often offer real page numbers, too. As you read, you can see not just your “Kindle location,” but the analogous page number from the dead-tree edition of your book. That’s very helpful for book clubbers and others who want to make sure they’re (literally) on the same page as folks reading regular old paper books. 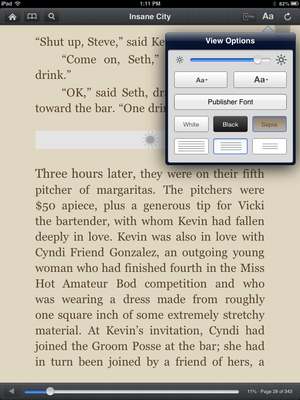 One missing Kindle feature—one that iBooks offers—is an option to see how many pages remain in the current chapter. With each successive update to the Kindle app, I hope that feature will appear. So far, it hasn’t. Amazon’s Kindle bookstore selection is huge. Amazon says it has more than 1 million books; By comparison, Apple now says its iBookstore offers more than 1.5 million books. Where once the Kindle store’s selection made Apple’s offering look paltry, that’s no longer the case; the stores—lofty marketing numbers aside—are roughly comparable. iBooks is very good, too. But the Kindle app shines in many ways, and it works great. If you’d rather avoid iOS lock-in for your ebooks, there are few disappointments to the Kindle app experience.